AAAAAH YOU DID IT AGAIN! I had to leave a comment here cuz.. YES I AGREE! I recently saw this again (for like the 9th time) and it floors me every time. The very very first time, I was in shock. It was a few months after the game first came out, I had already dumped 300 hours into the game with 2 separate characters, and I reached *here* with my Solasmancer first. I was in literal shock. Solas? Fen'Harel? SAY WHAT!? Then.. Every time I reached here again, I thought and thought more.. this was NOT a scene of him being cruel or vindictive or even unkind. The more I saw, the less I felt this was an attack, but a.. mournful blessing. And I reached here the last 2 times after discussing it with you, which of course made me watch it with newly re-opened eyeballs, and I have to agree. She knew what was happening. Cmon, she is Mythal. She had her little elfy spirit fingers in all the Solas pies. She was manipulating so many things behind the scenes that there is NO way on Thedas she had no clue what he was doing. She was the "greatest of them all" and I think that even in her quest for revenge against the Evanuris, she wouldn't see the People suffer more than they had to. And I really think she loved the world as it had evolved, even if it was a muted version of her own. She was still immensely powerful there, (I WANNA BE A DRAGON TOOOO) and she went above and beyond to help people she didn't *need* to help. Ima stop blabbering now. Jessi, thank you so much for this fantastic and thoughtful response. You make a wonderful point that I totally neglected in this post, which is that Flemeth (Mythal) has always shown herself to act on a greater, grander scale, on behalf of Thedas. She even says this in DA2, and it's awesome. I agree that she loves her people (and, I suspect, all people, not just the elves), which makes her a complex but chaotic agent for good. Also, can we all be dragons? I'm with you: Let's ALL be dragons! I think that there is a deep love between Solas and Flemeth. Perhaps not a romantic one, be but very deep. I believe the version of the story of Flemeth the wife, Conobar the jealous husband, and Osen the poet that Morrigan tells in Origins closely resembles the dynamic between Mythal, Elgar'nan, and Solas. Perhaps this is what drew Mythal to Flemeth. In any case, I think you're right about the meeting being planned, which makes me wonder: what are they trying to do? Pulling down the Veil is what Solas claims to want, but what was Mythal after? Tia, thank you for this reply, and for reading! I agree with you -- I think the story of Flemeth, Conobar and Osen deliberately mirrors in some ways the betrayal of Mythal herself. I think it actually happened as Flemeth describes (and that Flemeth's rage and betrayal called Mythal's spirit to her across the darkness), but I also think Mythal suffered a similar if not more catastrophic defeat when Elgar'nan and the other Evanuris betrayed her for their own selfish ends. I wonder about what Mythal wants too... I think she is consistently a seeker of balance. As she says in DA2, she is willing to "nudge" the world to achieve something beyond happy or sad, right or wrong. I think she is seeking a larger-scale restitution -- which also makes me think Solas either won't succeed or that what he wants won't KILL everyone, just change everything. Not bad, not bad at all. The one thing that I see differently is the explanation or description of the statues flanking the Eluvian. I see the sadness and bowed head of the dragon, but I feel that the wolf isn't necessarily triumphant, but rather a mournful and sorrowful howl of having experienced a tremendous loss. Very good interpretation though. Thanks very much, Mike! I absolutely agree that the wolf can be interpreted as being mournful here. It's a beautiful image, and wonderfully expressed. I think we do see the huge eluvian again in Trespasser - the last one Solas walks through. Kinaed, that's a terrific catch about the final eluvian Solas goes through in Trespasser! It does appear to be just as massive as the one at the Temple here (although interestingly, it is not one of the three-pane eluvians, but the more common single-paned eluvian). I think the idea that Mythal is possessing Solas is an interesting one, but I don't subscribe to it, myself. I just can't see Solas (who is so fiercely independent) as allowing that (and it's worth noting that he very emphatically refuses to drink from the Well, presumably, for that reason). Also, if you rewatch the scene and compare it to Flemeth taking the 'wisp' from Kieran, the soul-transfer thing seems to involve the small glowing 'wisps' (such as what Flemeth took from Kieran or that she puts into the eluvian in the beginning here). Meanwhile, what Solas does takes much older and seems rather to be him simply removing/absorbing her magic and life-force (versus her 'soul'). To me this is also why Flemeth goes completely dark at the end, as well. It's more about her life than her soul. So for me, I think Solas is still 100% Solas after this -- and that for good or ill he is following the path he has followed ever since he awakened. I literally drop everything to read your blog posts. Your loving analysis and deconstruction just elevate the experience of this game when it was already pretty freaking sublime!!! 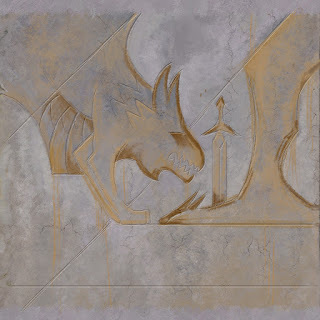 If one of Mythal and Fen'harel had to power up the other, why was it Mythal who gave her soul over to Fen'harel? Why was it obvious that he was the more powerful one, or the more appropriate choice? I think it's because they are in essentially different conditions. Mythal's spirit was riding around in Flemeth's body the way Urthemiel was riding around in Kieran's, but Solas IS Fen'harel. He physically resembles his portraits in all the paintings in Trespasser. That is his actual body. Fen'harel never died, and when he woke up, is it possible that he started walking around in his actual, original, egg-headed body?? That's already a pretty big step up from Mythal's possession of various regular mortals (and jewelry). 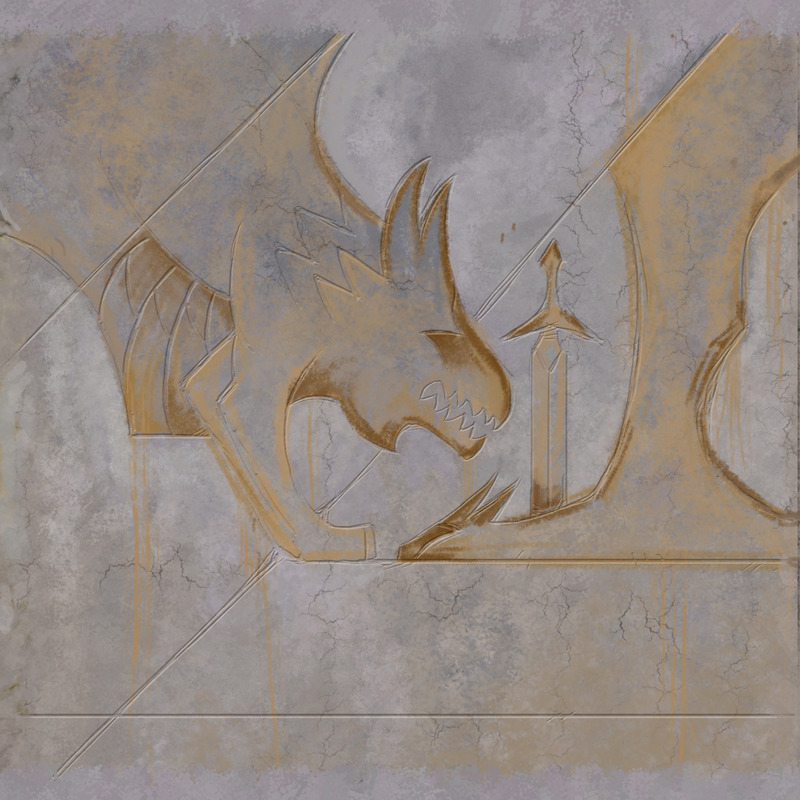 Another additional, little thing, is in the analysis of the unfinished mural. I think it's worth recognizing that Solas chose to illustrate the dragon as having been slain by a sword. It's iconographically quite central and significant to the composition of the panel. By shape, I'd say it's specifically referencing the Inquisition longsword. You know, the one the Inquisitor uses to behead people (if s/he chooses to execute people with it after s/he's done teetering on staircases with it aloft)? Pretty heavy associations there. 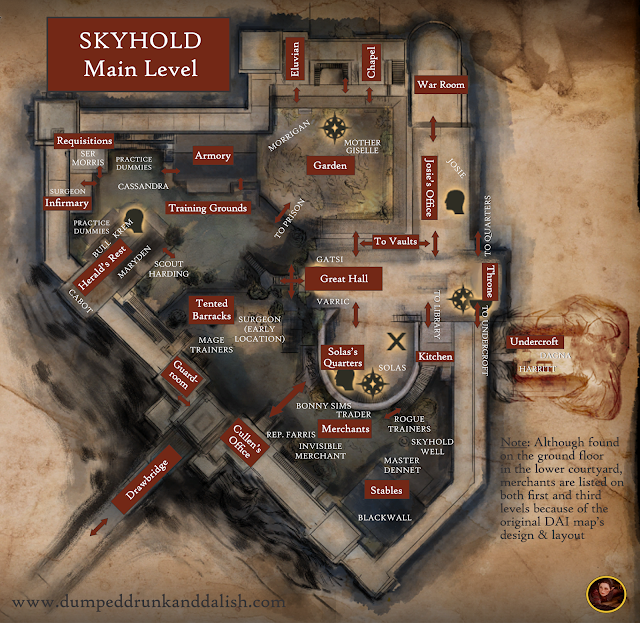 Is it the Inquisition's actions that have brought Fen'harel and Mythal to this position in some way? I don't have an answer! Thanks again for your amazing insights. I can't overstate how much I love reading your essays. First off, thank you so much -- that's a fantastic compliment, and really made my day. You make a great point about the differentials in power between Solas and Flemeth -- it's a fantastic observation because it's so important. Solas is physically an ancient elf and one of the Evanuris. Flemeth is, as you note, physically a powerful and ancient witch, but her body would presumably be far more fragile than his (which is why she has respawned herself over and over again through the ages). Also, great point about the sword resembling the sword of the Inquisitor. On this issue -- I'm a bit torn. I think the prominence of the sword in the mural HAS to mean something. But I'm not sure how to interpret it yet... the Inquisition certainly did help Solas get to the next step, even if the Orb was destroyed. It's interesting to note that there is another aspect to this scene -- that Solas anticipated it even before the breaking of the Orb in the final battle with Corypants. Which means that even if the Orb had not broken, Solas still foresaw that he would need the power-up from Flemeth to proceed with his plan to remove the Veil. Leaving a comment here because Twitter annoys me when I'm typing up storms. There's no doubt in my mind that Mythal knew of Solas's plans and is sympathetic to them. I'm sure it was pre-planned. I'm grateful for how they handled his villainy. They made him truly complex, and turned him into a Big Bad that you're conflicted over (well, some people aren't.) Evil has a backstory - and that's an interesting thing, because Solas and Mythal (using what knowledge we can gather from this scene) don't view his plans as necessarily evil. Some of us have acted out in grief and anger and made mistakes that shook our personal worlds to their cores. We can often long for a way to take it back and restore things to the way they once were. Solas changed the very essence of the entire world and woke up to an alien planet that he did not recognize, that looked to him like it was dying. The difference between us and Solas is that he has the power to restore what he had undone, for better or worse. Of course he is aware of the consequences, but they hold very little weight to him. Why shouldn't they? He doesn't know this world. He doesn't know these people. All around him is death and destruction, and people turning a blind eye to a brilliant, complex, magical past - the memories of which have already been twisted and buried. The truth of the world has been too easily forgotten. A friendly or romanced Inquisitor is the only person who seems to cause him to start questioning himself. Mythal seems almost motherly in her love for him, which.... Knowing who Mythal is, isn't really very surprising. We see him most vulnerable with her. We do not often see him speak of his failures while also being so visibly moved by them. He has no interest in feigning remorse, sorrow, or regret - Mythal knows him and she'd see right through it, which implies that this scene between them speaks of his true nature around those he loves and trusts. The meeting between them makes me think about the mural. The sword in the dragon's back obviously points to betrayal, but Mythal appears not only to be fully aware of what's happening and what's going to happen, but also to give herself willingly to him. Of course, it's possible that while Mythal doesn't appear to view this as a betrayal, Solas may - which would make sense for him, given, you know ... everything. Truth is subjective. Another reason I find it interesting is that it can also call back to when Mythal was betrayed. Fen'Harel obviously grieved before (and during) acting out. Claricia, thank you for that thoughtful and eloquent reply. "Some of us have acted out in grief and anger and made mistakes that shook our personal worlds to their cores. We can often long for a way to take it back and restore things to the way they once were. Solas changed the very essence of the entire world and woke up to an alien planet that he did not recognize, that looked to him like it was dying. The difference between us and Solas is that he has the power to restore what he had undone, for better or worse." I think the observation you make here that is most resonant to me is the fact of Solas's curious tunnel-vision. He's absolutely blind to any other options -- all he can see is the task of undoing what he did before, regardless of the cost. And the worst part is, as you note, he has the power to do this (or he understands how to assemble that power). I think the only way we can possibly hope for a good outcome here is that we (I hope) get more chances to talk to Solas, to continue to try to shake his perceptions and to change his mind. We almost did it once before. I definitely think Solas sees what he will do to Flemeth to be a betrayal (whether or not Flemeth does). On the sword... fascinating point there. And it's interesting -- the Inquisition is symbolized by a sword pretty literally on the second panel of Solas's frescoes. I agree with your assessment.Flemeth's human body and reached the end of it's usefulness/life. Morrigan obviously would have refused to take Mythal's/Flemeth's spirit. Her trust in her mother is nil, made worse by the fact that she's unwittingly given herself into Flemeth's hands (if you played it that way). Where was she to go other than become a part of the ancient elf she most trusted? I don't think that she's gone forever, I think she sent a bit of herself and the other Old God into the mirror to somewhere/something. I never saw this scene as Solas "stealing" her life force. I always thought it was a voluntary gift. Thank you for stating the case for this view so well. Carmen, thanks for sharing your thoughts here (and apologies on the late reply -- I missed that you had commented). I'd never considered that Flemeth might have approached Morrigan to shelter her 'wisp' for safety, because of Morrigan's paranoia and fear about being possessed by Flemeth -- but it would have been an interesting and even tragic conversation to witness between the two. I agree with you that Flemeth has saved the 'Mythal' wisp in the eluvian -- I just hope there's something of Flemeth that remains as well. Especially since Flemeth makes a point of stating that she and Mythal are one person now, no more separate than her heart in her chest.